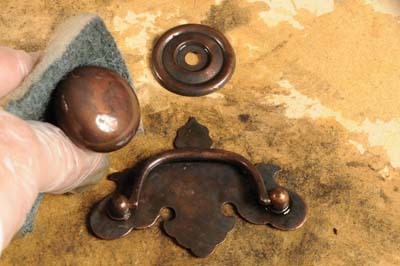 There are loads of handles and other furniture hardware on the market, some of it antiqued others in bright finish. These different effects don't always suit our needs and something more hand finished can make them look a lot more convincing and right - the answer is to patinate the metal to give it an aged or worn look. 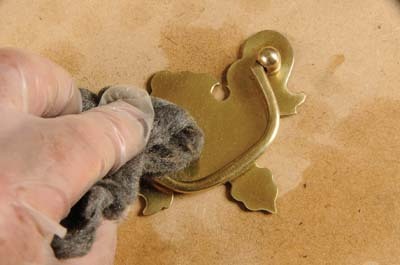 This can be done to brass, bronze, iron and steel if you have the correct product. You can create an effect using vinegar or even seawater! However, for convenience and predictable results, it is easier to buy the ready made stuff. We show you how the whole process is done. All chemicals carry a potential risk depending on the usage. For paint stripping, thick nitrile chemical resistant gloves are essential. For other operations in the process, latex gloves usually suffice. Full protection eyewear is sensible in case of splashes, and a source of clean fresh water should be present for irrigating the eyes in case of an incident and for washing hands and, indeed, the various components you are working on. Lastly, no eating or drinking while working to avoid ingesting chemicals. 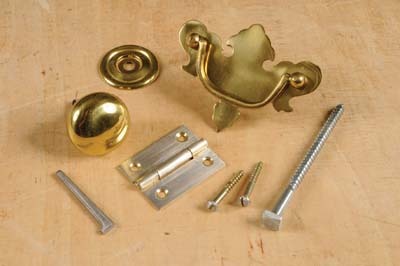 Bright metal components in the case of brass are usually lacquered. This needs to be stripped off with paint stripper in a ventilated area. Iron or steel may need fine abrading to give a more hand finished appearance, or to remove a 'passivated' metal colouration. 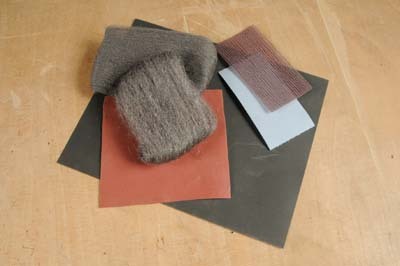 A selection of coarse 0 and fine 0000 wirewools and very fine grit abrasives should be to hand from 280grit and finer. Standard green faced scouring pads are also very useful for removing the stripping gunk and giving a slightly rubbed finish (see photos 1-2). 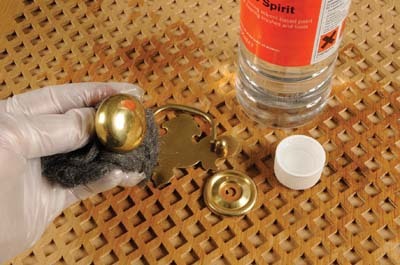 It is essential to remove all lacquer and neutralising agent, normally white spirit, so you have completely bare metal. Kitchen scourer and washing-up liquid is excellent for achieving this (see photos 3-4). You can either use neat fluid or dilute 1:10 for a slower, more controllable effect. I used it neat but the problem is that the resultant effect is dark and can be uneven until you use a scourer to re-clean the surface, and the patina can flake off. It will however stick eventually (see photo 5). The patinated finish will not only be too strong but also too even and slightly rough, therefore some careful work with 0000 wirewool is needed to give a convincing worn look, leaving a dark build-up around projecting parts and indented profiles etc. 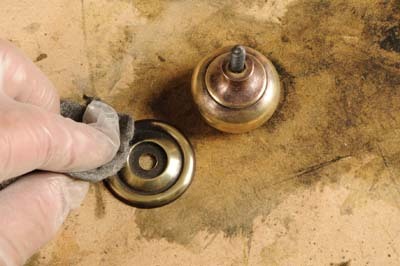 Once you are happy with the effect, apply some clear wax or jade oil to seal the finish (see photo 6). Fitting the hardware is as normal but use some dark wax rubbed around the fittings to give a build-up of wax so it looks as if it has always been in place. Job done!